I chose a British parliamentary mace as the header for Parliamentum, because the mace represents the Crown-in-Parliament (sometimes called the Queen-in-Parliament) and the authority of the Speaker and of the House of Commons to pass laws; it always points toward the government, to the Speaker’s right, and daily parliamentary business cannot begin until after the ceremonial procession, where the Sergeant-at-Arms places the mace on the table. The parliamentary maces in most legislatures and parliaments in the Commonwealth resemble medieval sceptres, like that which the British monarch carries at the coronation, adorned with the Crown of Saint Edward. This shape makes perfect sense for a symbol of the Crown-in-Parliament and the House’s authority to pass law based on the Crown-in-Parliament as the guarantor of our liberties in a constitutional monarchy. However, such an overtly kingly symbol seems a damn sight odd for a state legislature in the United States of America, but some of the legislatures of the original 13 Colonies have retained the standard maces made of gilded silver and adorned with the Crown of Saint Edward in homage to their colonial heritage. Indeed, these legislatures are special, because they predate the Continental Congress and the United States Congress by several decades. 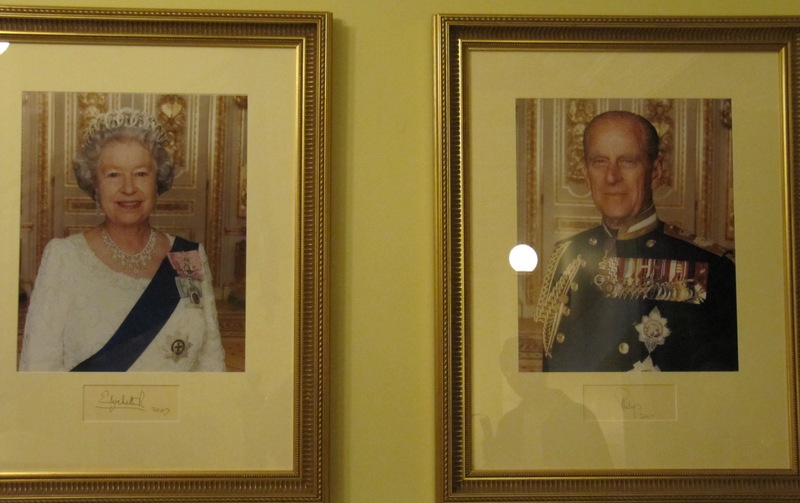 My parents visited the Virginian legislature in 2011 and took this photo of the official portraits of the Queen and Prince Phillip, who visited in 2007 to mark the 400th anniversary of the founding of Jamestown. So how do the modern Americans legislatures circumvent or re-interpret the meaning of the mace as the symbol of the Crown-in-Parliament? The website of South Carolina State House explains that the mace of the House of Representatives is “the emblem of authority for the House of Representatives.” The House of Representatives of South Carolina has even retained the ancient ceremonial procession of the mace: “for the Sergeant-at-Arms to bear the mace ahead of the Speaker and lay it upon its specially prepared rack on the Rostrum in front of the Speaker.” Interestingly, the Senate of South Carolina has retained what appears to be an defunct tradition of the House of Lords by using the State Sword to represent the authority of the Senate. To me, it also inadvertently symbolizes South Carolina’s famous bellicosity and proud independent streak! After all, it was the first southern state to secede from the Union and produced the likes of John C. Calhoun and other vehement slavers and secessionists. A mace only logically makes sense if it represents the authority of the legislature, where sovereignty lies. But both of the Virginian and South Carolinian explanations omit that the Constitution of the United States of America vests sovereignty not in the president, nor in the Congress, but in the people, thanks largely to James Madison. (And I’m fairly certain that all the states abide by this legal doctrine as well). By vesting sovereignty in the people of the United States, the Framers by-passed the issue of whether the federal government or state governments would supersede one another; they made both orders of government accountable to the same sovereign. The electorate, not the legislature, is therefore the sovereign. And if in these state legislatures, the maces represent the authority of the “government”, then to which side of the lower house do they point? Presumably they would point toward the majority party. These maces could represent the authority of the legislative branch of government or the legislature, but again, legislatures are not the sovereign in the United States. While the British sovereign or a Governor General cannot withhold Royal Assent from a bill that has passed through parliament, the Governor of a state can veto any legislation passed by both houses, and the upper house can reject legislation passed by the lower house. So what is the point of representing the “authority” of the lower house or that of the “government”, a misnomer in any case, since the Governor also forms a part of the government, when that authority is subject to the checks and balances and division of powers of the American system? Here is the Virginian mace in its display case. (My parents also took this photo in 2011). During the American Revolution, the southern colonies produced proportionately more Tory Loyalists than did the North – particularly in contrast to those rebellious, Puritanical New Englanders! In that sense, I’m not surprised that some of them continue to use these British symbols but have attempted to adapt their meaning and remind their citizens that their legislatures pre-date the US Congress. Perhaps Virginia and South Carolina invoke this old British symbolism of the legislature’s power in order to represent the 10th Amendment’s primacy of the states over the federal government in all residual powers. Either way, I find their use of British maces quite interesting and rather ironic. One thing that I have always found interesting about the mace (in Parliament – not sure if they also do this in the provincial or state legislatures), but when the House is sitting as a committee as a whole, the mace is moved from the top of the clerks’ table to a bar just below it. The mace is also kept this way when Parliament starts sitting until a Speaker is elected, at which point the Sergeant-at-Arms comes forward and moves it up to the surface of the table.